FOR FIRING, SINTERING, BRAZING,ANNEALING & OTHER HEAT TREATMENTS. Successful heat processing of ceramics, metals and glass demands close temperature control and uniformity. 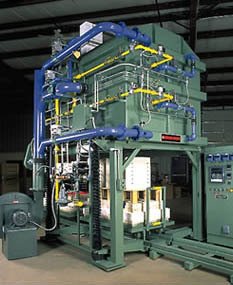 That’s why UNIQUE/PERENY Kilns and Elevator Furnaces are routinely used for firing, sintering, calcining, brazing, annealing, metallizing, and other heat treatment of a wide range of products at temperatures from 1000F up to 3200F/(1760C). Microprocessor regulated heat input surrounds and penetrates the work load to provide both temperature control and uniformity. This is especially important with extra dense loads like tightly packed small items or large, heavy, ceramic or metal parts, or crucibles of molten materials. 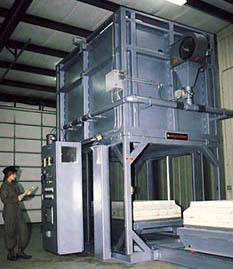 With an Elevator Furnace, product is easily loaded and unloaded with a motorized lift mechanism that is designed for vibration free movement, even when stopped or started at any point of travel. 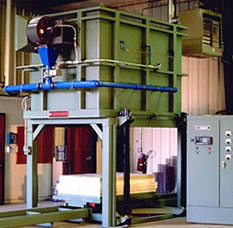 Complete access to load or unload product quickly is possible because the car which also serves as the furnace hearth can be rolled clear of the furnace area. Additional cars for greater productivity and various muffle retorts for atmosphere work are available optional accessories. Heavy steel case and superstructure, welded and reinforced to form an integral unit with attractive exterior finish. Durable, high temperature ceramic lining backed with energy efficient, graded, multilayer insulation. Amply rated, long life heating components surrounding the work area for maximum heat transfer and temperature uniformity. Car hearth and motorized elevator mechanism designed for vibration free movement and stop-start operation. Programmable microprocessor based temperature controls with overtemperature protection. Control panel completely wired with necessary power supply, switches, meters, lights, relays, fuses and other UL/CSA listed components. Comprehensive operation and maintenance instruction manuals. Factory inspected and ready to install and use. Product technical support, service and spare parts availability. Custom built units designed to meet specific requirements. Additional car(s), track, car haulage and load/unload equipment. Auxiliary ports, air circulation and accelerated cooling systems. Atmosphere gas-tight case construction and burn-off chambers. Neutral or reducing atmosphere muffle-retorts with special seals. Atmosphere gas mixing and flow control panels. Purchaser selected control instrumentation packages and panels. Computerized process control systems and data records. Multiple temperature zone control systems. Factory installation, startup or complete turnkey service. porcelain, abrasives, glass. METALS: Ferrous, non-ferrous, brazing, annealing, hardening, sintering, heat treatment. Adequate building and foundation with clear access for installation. Utilities necessary to operate equipment satisfactorily. Personnel and facilities to off load and operate equipment. instruction manuals and applicable codes. Exhaust hoods, ducts, vents, safeguards, and interconnections asmay be required by codes or insurers.